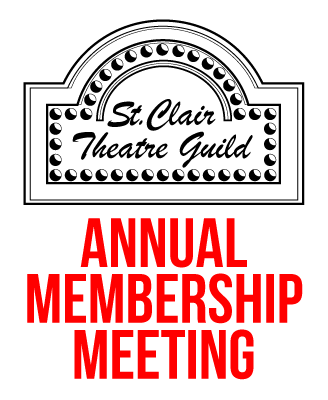 The Annual Meeting of the members of the St. Clair Theatre Guild will be on Sunday, September 16, 2018, beginning at 4:00 p.m. The meeting will be held at the Guild Building on Goffe St. in St. Clair. The Board wishes to update attendees as to the Guild’s future plans and request input. We welcome all past members, friends and potential members. We will have snacks and beverages on hand and look forward to your attending. The agenda includes a vote on a proposed bylaw change and elections for the Guild’s Board of Directors. Four current members will run again for two-year terms. Read a related message from Guild President Brian Moss. This entry was posted in Events, News and tagged annual meeting, Board of Directors on August 29, 2018 by Tom Kephart. We are pleased to have four members whose term expired return to the board and to welcome four new board members (indicated with an asterisk). This entry was posted in News and tagged Board of Directors, election on October 1, 2014 by Tom Kephart.